I have a confession I have never worn a waistband that had elastic in only a portion of it. I don’t know why but in my mind it felt like cheating. 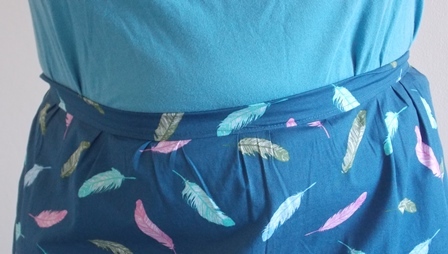 I have no problem wearing a waistband that is fully elastic or one that is just a woven with a zipper closure but never the combination of just elastic in the back section and a woven band at the front. It is one of those silly little things that your mind makes up. 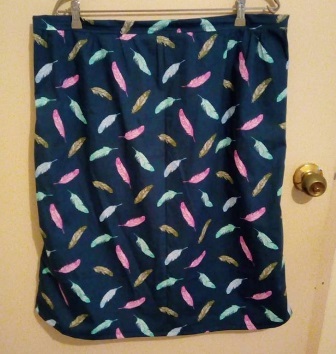 On the Cashmerette Facebook group someone posted a photo of the Elastic Back skirt. It is a free pattern that you can get if you sign up to receive the Cashmerette newsletter. 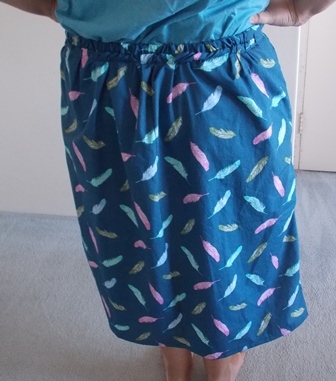 I had some fabric in my stash that I purchased last year just waiting to be made into something so I thought why not step outside my comfort zone and give it a try. For the front you gather the fabric in slightly. I did my gather stitches by hand instead of machine. Hand stitching is something I enjoy so I just did 2 rows then pulled in it to fit. I tried to keep my gathers even and I pretty happy with how it ended up. It isn’t one of those skirts that has a lot of gathers at the front I think the pattern is written so it has a nice amount. 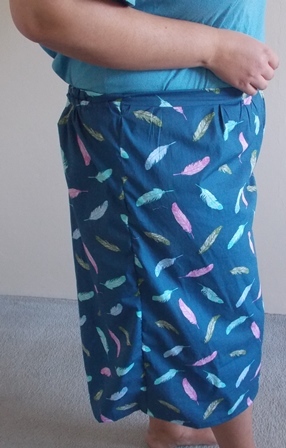 The back waistband I didn’t finish the neatest as my stitching is a little off track but I am not worried. If you haven’t realised by now I am not a sewing perfectionist. If it is in an area that no one is really going to see then I don’t bother fixing drunken sailor stitching unless it impacts the fit or construction of the piece. My waistbands are always covered so no one will see them and frankly who cares if they do. This skirt is actually very comfortable. It didn’t feel weird having only the elastic in the back. It felt secure and didn’t feel like it was falling down. I wore it the day that I made it and then also to work that same week. This ticks everything off my list when it comes to choosing a pattern to make. It is fitted to my size and is comfortable and I don’t feel like I am cheating! It is a very simple and classic style skirt that won’t go out of style. 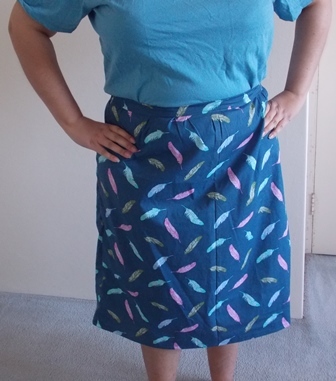 As for quirky I have another crazy bird lady skirt! The fabric is a cotton I think a poplin, it isn’t a quilting fabric. This is a longer length than what I normally wear as it falls past my knees, the tutorial explains how to make it any length you want. If I make it again I might make it above knee length but I had no issues wearing this length. It was fun to step outside my comfort zone. I think it is about time I start doing more of it.